My Lesson in Camera Theft! 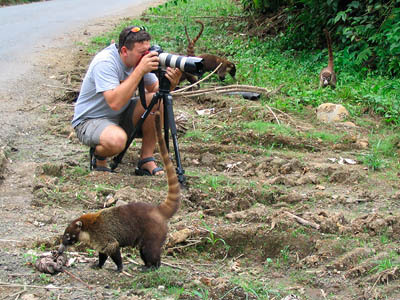 Left Photo: That's me shooting a group of Coatimundi, a couple days before losing my gear and photos to theft. Right Photo: There's the smashed window of my rental SUV - and no more gear! It could never happen to me! That’s exactly what I thought until I was robbed on my last day of a two week photo trip in Costa Rica earlier this year. My camera gear was stashed out of sight on the back seat of the locked rental SUV, which was parked in a visible spot on the main street of a tourist town. It was around 9am, and I’d ran into a shop 50 yards across the street for just a few minutes. 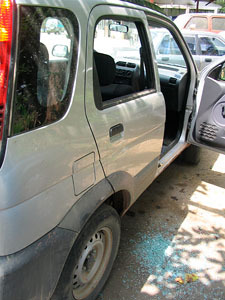 When I got back to the vehicle, the back window had been smashed and my camera bags were gone. My heart sunk! I lost thousands of dollars of camera gear and, more importantly, all my trip photos - 1200 shots of everything from monkeys to motmots, coastlines to cloud forests. 1. Never leave your gear unattended! It sounds so simple, but if only I’d only carried my camera pack into the shop with me for those few minutes, I wouldn’t be writing this now.... instead, I’d be showing you all kinds of great Costa Rica photos! Keeping an eye (or hand) on your gear is, by far, the best way of preventing theft. ‘Pac Safes’ are steel mesh travel security devices that fit over your camera packs, and have a cable you can lock to something sturdy, like a car frame. They come in various sizes to fit different packs, are fairly light weight, pack small and cost about $100 or less. I’ll never travel without one again - they’re excellent for preventing ‘smash-and-grab’ thefts like I experienced. 3. Keep a low profile with fancy gear. Expensive gear stands out, especially white Canon lenses which are instantly recognizable as quality gear (no offence intended Nikon-folk). The day I was robbed, I’m pretty sure that the thief saw me photographing out on the shoreline early that morning - then followed into town where they broke into the car. I put ‘all my eggs in one basket’ in Costa Rica, by storing all the trip photos on one portable hard drive, which was in my pack that was stolen (this was a very dumb thing to do!). I should have kept the hard drive on me and had a full backup stashed away somewhere else. Film shooters - you can’t really back-up, so I’d never let the exposed rolls of film leave your side. 5. Check your camera insurance. My stolen gear was worth about the same as a new small car, so without good insurance coverage I would have been cooked.... ready to give up photography and take up lawn bowling! My policy with State Farm is excellent - they replaced it with new gear swiftly. If you were robbed tomorrow (either at home or on a faraway trip), will your insurance cover full replacement of your gear? If you’re not sure, call your insurance company and book an appointment ASAP! Your homeowners policy may cover your gear when you travel, but check for any limitations. A special ‘rider’ policy for your camera gear is the best insurance, and well worth the relatively low cost. Be sure to read all of the fine print on the policy. 6. Inventory your gear before travelling. Make a list of all the camera gear you’re travelling with. Leave a copy at home and carry one with you during your trip in a safe place (eg. with your passport, in your pocket!). If you do get robbed, you’ll have a list for the police and a record for your insurance company. One of the hardest parts of my ordeal was trying to communicate with the Costa Rican police (I don’t speak Spanish well, they don’t speak English well). If robbed, you need a police report that lists all your gear. It’s particularly hard to communicate technical camera specs (makes, models, descriptions) in another language. A list in my pocket would have made life much easier! Disclaimer: Don't let my experience stop you from travelling to Costa Rica - it could have happened in any city around the world. Costa Rica is a wonderful country for photography with a high natural diversity, stunning scenery and very friendly people. I'll be going back there soon!